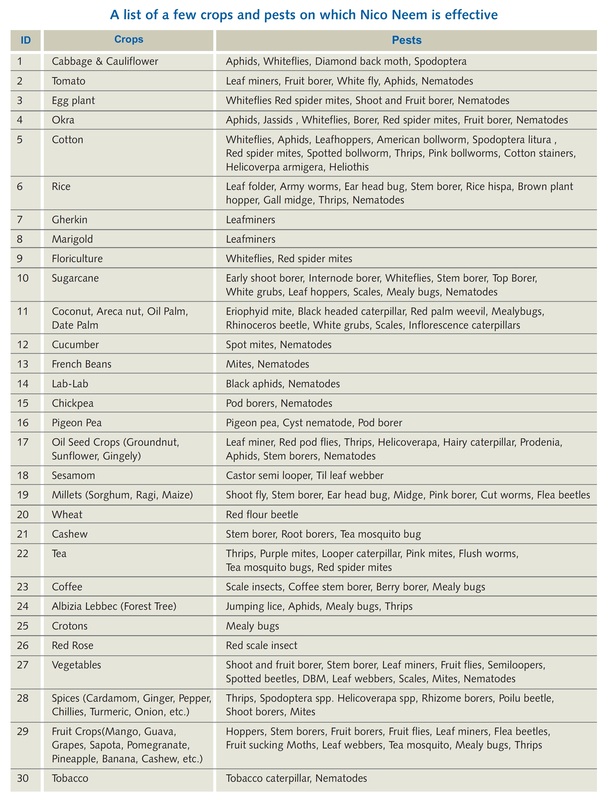 Categories: All Products, Bio-Pesticides, Botanical Neem based Pesticides and Fungicides. Tags: Neem Based Pesticides, Nico Neem. is maintained at a level of ~300, 1500, 3000, and 10,000 ppm in the formulation. A very wide spectrum of phytophagous insect-pests is affected by this Neem formulation. NICO NEEM is non-toxic to beneficial and non-target organisms. It leaves no residue in the soil, crop or the environment and is highly bio degradable. An excellent alternative to hazardous chemical fungicides. as well as for veterinary use. It is truly an environment friendly product. 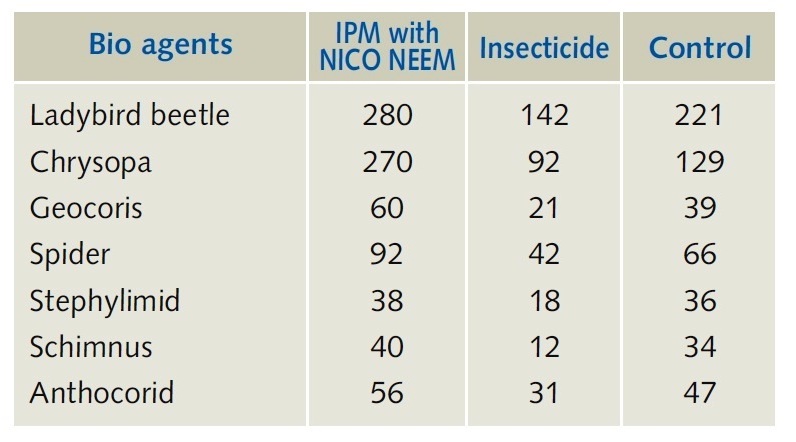 Through the use of Nico Neem you can prevent the development of resistance in pests. resistant to chemical pesticides or are otherwise difficult to control. though it may not kill instantaeneously, the eventual results are very effective. Experiments were conducted at the Gujarat Agricultural University, Anand – India. insect-pests would multiply so quickly that they would completely ravage the crop. generation. It is not unusual for the mortality rate to reach 98-99%. in the absence of prey, some will survive. they must be used judiciously in order to save these vulnerable natural control agents. 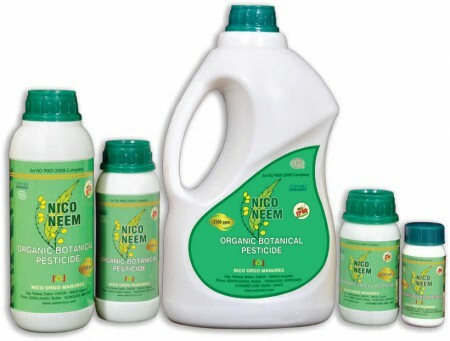 apply a spray of NICO NEEM. The spray is generally effective for fifteen days. which should be sprayed on the crop. container before filling into a spray pump. In case of rain after spraying of NICO NEEM, re-apply the dose. As NICO NEEM is photodegradable, it is advisable to spray the mixture during evening hours. water along with NICO NEEM. sprayed on the crop of one hectare area. 1000 litre tank, 200 litre barrel, 5 litre carboy,1 litre plastic bottle, 500 ml. plastic bottle. devastating diseases like malaria, filariasis, dengue &chikungunya. 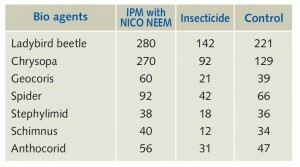 Studies have shown NICO NEEM to be highly effective in vector control. A spray of NICO NEEM in mosquito infested areas can greatly reduce their population. repels, disables or kills mosquitoes coming into contact with it. How is ITN different from LLIN? user himself can treat by dipping in a WHO recommended insecticide. insecticidal effect the net should be re-treated after 3 washes or at least twice a year. and thus extremely susceptible to predators such as birds. Grasshopper nymphs are affected by NICO NEEM in a similar way.